Cider Mill Friends had a table at the Fair Trade Bazaar at Vassar College. We spread the word about the organization, sold merchandise, and accepted donations. Check out the details of our annual event here. Thank you to the volunteers that helped us process the locally-picked apples and make our Kimlin Cider! Volunteers helped us clean up the mill and make last-minute preparations for our annual cider tasting event. Cider Mill Friends had a table at the Arlington Street Fair on Raymond Avenue in Poughkeepsie. This was the 15th year of the street fair. Thank you to the volunteers that joined us! Volunteers cleaned up around and inside the Mill, including weeding under the pergola and going through the artifacts that were pulled out of the dilapidated shed before it was partly demolished. Thank you to the volunteers that joined us! Thank you to the volunteers that joined us as we cleaned up inside and outside the Mill. Cider Mill Friends was present at the Town of Poughkeepsie Law Enforcement & Youth Community Awareness Day (formerly known as FUSE) on the Vassar Alumni Lawn on the west side of Raymond Avenue. The community day was free and open to the public (aimed towards youth). There were refreshments, face painting, games, music, inflatable rides, karate demonstration, police car to view and sit in, police canine unit demonstrations. Many other agencies and businesses were present. 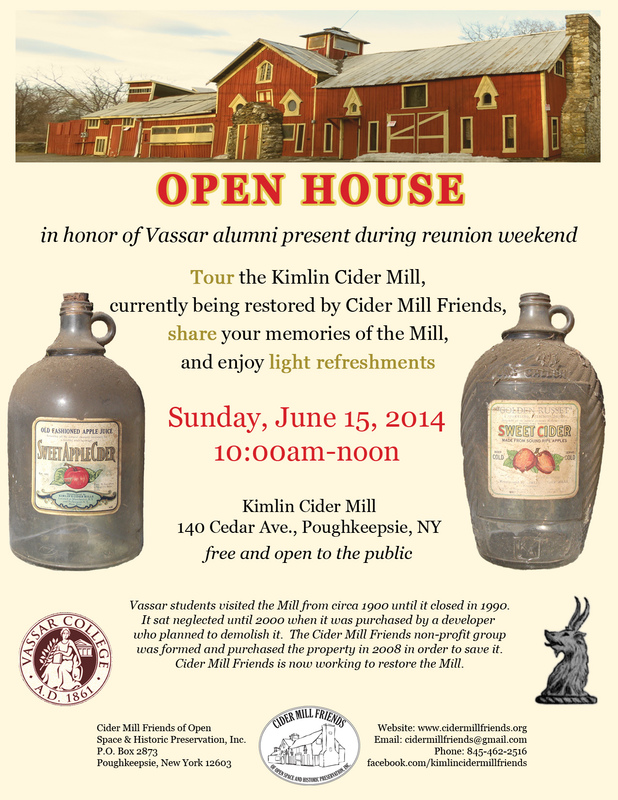 We welcomed Vassar alumni back to the Kimlin Cider Mill as they celebrate reunion weekend! Some members of the public also showed up, which was great. Many things were accomplished during this work day: Branches and vines were chipped, the electrical hook-up process began, and the café room was completely swept and organized in preparation of a visit from Vassar College alumni. A small but determined group participated in the May work day. We successfully put a second coat of stain on the new farm gates and portions of the kiosk that were not previously stained. Future work days are: June 7, July 12, August 2, September 6, and October 4. Please join us for any or all of these work days from 9:30am to 12:30pm where volunteers come together to work on clean up, maintenance, stabilization, and preservation efforts at the Mill. Note that work days can be canceled or rescheduled due to inclement weather, so if you would like to help out at a work day, please contact us ahead of time so that we may notify you of any changes. This work day was a huge success! Many volunteers came out and we worked until 3pm. Future work days are: May 3, June 7, July 12, August 2, September 6, and October 4. Please join us for any or all of these work days from 9:30am to 12:30pm where volunteers come together to work on clean up, maintenance, stabilization, and preservation efforts at the Mill. Note that work days can be canceled or rescheduled due to inclement weather, so if you would like to help out at a work day, please contact us ahead of time so that we may notify you of any changes. Some of the volunteers at the April 2014 work day. A “before” shot of the foundation, covered in brush and vines. An “after” shot of the foundation. We set up a table at the Sharpe Maple Celebration and spread the word about our organization. Thanks to those that volunteered and attended! Table at the Sharpe Maple Celebration. One of our volunteers at the event. Our first Saturday work day of 2014 was canceled due to weather. Future work days are: April 5, May 3, June 7, July 12, August 2, September 6, and October 4. Please join us for any or all of these work days from 9:30am to 12:30pm where volunteers come together to work on clean up, maintenance, stabilization, and preservation efforts at the Mill. Note that work days can be canceled or rescheduled due to inclement weather, so if you would like to help out at a work day, please contact us ahead of time so that we may notify you of any changes. This was our third year participating in the Great Backyard Bird Count (GBBC). 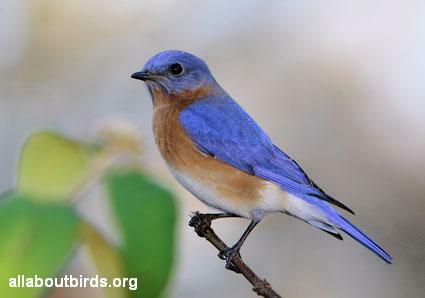 The GBBC is an annual citizen science project run through the Cornell Lab of Ornithology enlisting folks all across the country to census resident birds that have made it through the winter time. This project is just one way for participants to get involved in the ever-growing realm of citizen science and learn about birds while doing it. We surveyed the grounds of the Mill every morning starting shortly after sunrise from Friday, February 14th through Monday, February 17th for about an hour each morning. We encouraged volunteers to join us on any of these mornings as it is much easier to spot birds with multiple pairs of eyes. Thanks to those that braved the winter weather!